An efficient heat source for many industrial and commercial applications, the Black Body and Chameleon Ceramic Infrared Heater is available in an array of sizes and modules. Underwriter's Laboratories component recognition is available on many of the items shown. Parabolic or flat profiles, square, rectangular or round shapes, mounted in housings or panels, Black Body and Chameleon Ceramic Heaters can easily be installed and arranged to produce heat patterns limited only by the imagination of the designer. 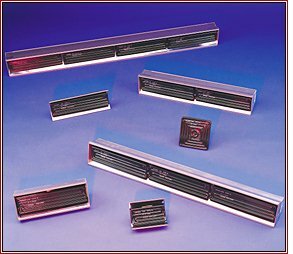 HR Radiant Heater assemblies are Incoloy sheathed tubular heaters mounted in an aluminum housing with a reflector to provide a uniform band of radiant heat to the working surface. Broad beam - for use as a surface heating medium. Break, splash, shockproof metal sheath heating element - extruded aluminum housing. Absorbed easily by all colors, clear glass, plastics, transparent solids and liquids. FAR Infrared - Long invisible radiant wave length (2.5/3 microns). Typical work range to 500 F, practical maximum to 900 F.
For outdoor or hazardous locations specify M7 Terminal enclosure. Normally used perpendicular to direction of work. May be ganged together for continuous heat bank. Snap-on nickel-plated protective grill available. at any point along the length of the housing.